Updated Dec 8, 2009, 10:44am: a slightly older article from the LA Times discussing certain fears of cloud computing. Updated Nov 17, 2009, 9:00 pm: read the latest features of Microsoft's Azure cloud computing platform at Microsoft's Professional Developer Conference (PDC) 2009. The idea of cloud computing has been around since the mid 90's and similar services have been offered since 1999. With new advances in technology and data center equipment, services of this type are becoming more prevalent. 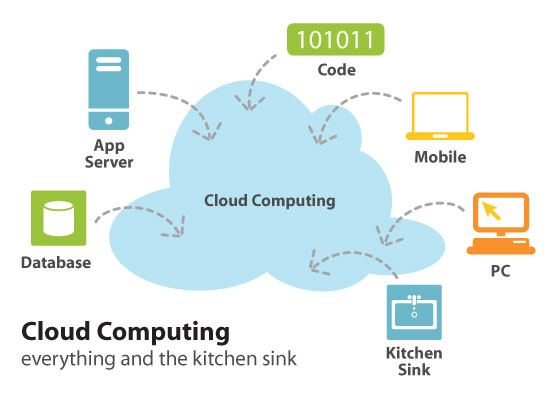 Cloud computing is the idea that all data, applications, software, etc. can be stored and accessed in 'the cloud' (over the internet). The name originates from flow charts and diagrams where the internet is symbolized by a cloud. Business applications are accessed through web browsers with the software and data stored on servers elsewhere-- the user never physically owns the software. Think Google's Gmail versus Microsoft Exchange-- nothing is stored on your PC or on your company's server. The ability to access your vital software and applications from any laptop, PC, or mobile device (iPhone or Droid Phone) changes the fashion in which work is done. Collaboration with co-workers and customers across the globe is a snap. Services using cloud computing are often utility-based (even free), meaning you pay for what you use, making this a perfect option for small businesses and companies with fluxuating network demands. The companies do not own the physical components, which cuts down on capital expenditures making cloud computing a viable option for many start-ups. While many services are currently offered 'in the cloud', it has not reached its full potential as seen by software giants. NOTE: IT professionals agree that cloud computing is not yet ready for large businesses, but expect this to soon change. As cloud computing gains momentum and companies become more reliant on cloud services, the demands on data centers and the equipment stored within its rack space increase. Although no definitive time frame has been given, tech pundits are predicting all IT services to be hosted within the cloud at some point in the future. As we make this transition, data center expansion is a must for this idea to be effective and greater demand will be placed on these co-location services as more businesses and individuals turn to the cloud. What does this mean for the contractors of our industry? Simply put, the major forces of the data center market are prepping for cloud computing adoption. Large build-outs, expansions, and new centers are needed in anticipation of growing demand. Analysts predict a new generation of data centers are on the horizon-- centers designed for quick deployment as need in an area rises. Some dismiss cloud computing as just another tech buzzword (there's no shortage of hype) and certain consumers remain wary of security issues, but big names in tech like Google, Amazon, HP, Yahoo, and Microsoft have already made their foray into cloud services and are enjoying success. Speak with the technicians at your area data centers and ask how they are preparing for this coming shift. As I mentioned earlier, this concept has not yet reached its full potential. Early adopters and innovators are making headway in this area, but mainstream enterprise still remains skeptical. Those who see the coming trend and are preparing for it will be the ones who cash in. What do you think will be the largest obstacle cloud computing must overcome to become accepted by the mainstream? Leave your thoughts in the comment section below. This is the first article in a 2 part series detailing cloud computing. Look for part 2, an interview with Ian Seaton of Chatsworth Products, Inc., coming soon.